According to the Sunnyside Post, Anise Fusion is an Indian/Chinese restaurant. I disagree. They have a number of Thai dishes on their menu and only a few hints of Indian (the mango lassi is the biggest giveaway). Regardless of their ethnic origins, their menu has too much going on and not enough flavor. We decided to order from Anise Fusion as a function of Hurricane Irene. What restaurants would be open during the catastrophic event? We thought we’d try the new place in the face of the end of the world (as reported by the TV meteorologists). For appetizers, we opted for the lollipop chicken and chive pancake. 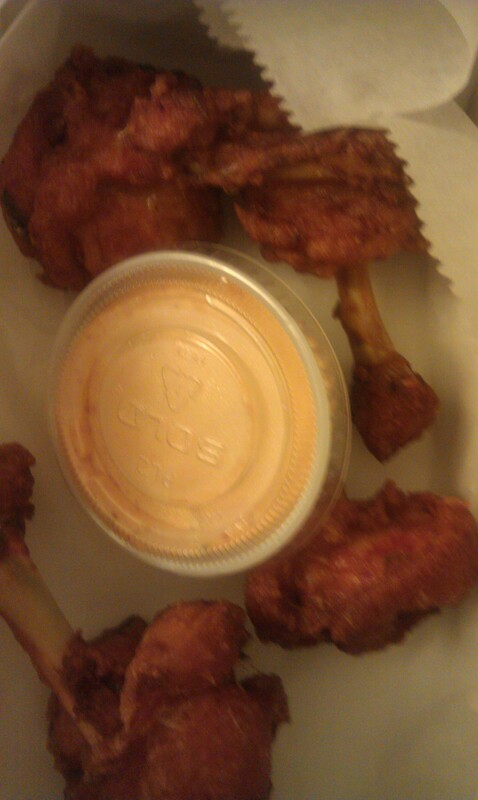 We ordered the lollipop chicken because we had been so fond of Tangra’s. There were four pieces, all of which were crisp and light on the meat, as they should be. Both my dining partner and I enjoyed them. Anise Fusion definitely does the dish justice. The chive pancake was a disappointment. Dark green and cut up into bite-size pieces, the pancake lacked flavor and was accompanied by a soy-like sauce. I wouldn’t recommend it. Yum Yum Queens puts out a much better rendition. My dining partner ordered tofu with cashew nut sauce, a Chinese delicacy. 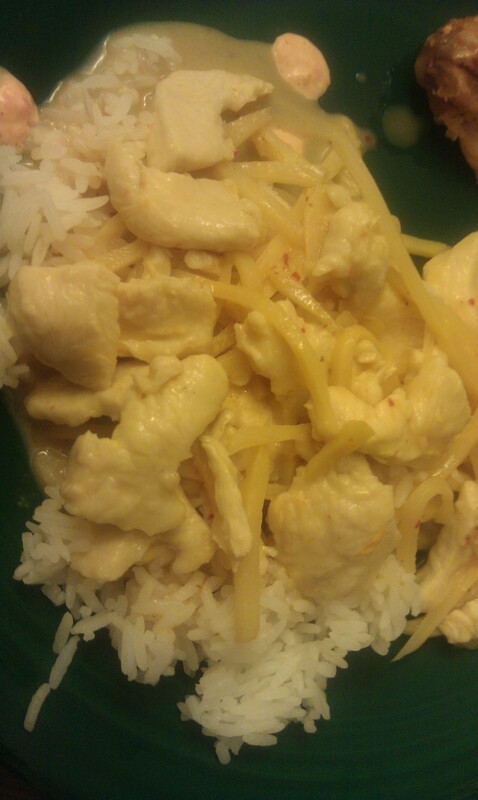 It lacked flavor and punch, though I liked the inclusion of pineapples in the dish. I got the red curry with chicken, a Thai specialty. I make red curry with tofu at home all the time and it comes out just fine–a thickened sauce with bamboo shoots, peas, and green beans. This is what I expected of Anise Fusion, at the very least. I was sorely disappointed. The red curry sauce was thin and flavorless, and there was an ample presence of bamboo shoots–an almost overwhelming presence–without anything else. I usually like to see some vegetables in my red curry. Anise Fusion didn’t deliver. I wouldn’t recommend ordering red curry from there–again, Yum Yum does a much better job with this dish. If you’re looking for Indian food, try Saffron Gardens. If you want Thai, try Yum Yum. If you desire fusion, definitely go to Tangra, which is right around the corner from Anise Fusion. You can get take-out from all of these places (I’m almost certain). Don’t waste your time with Anise Fusion. The best part of my meal was the Thai iced tea that I ordered–but, honestly, who can screw that up? Take the 7 to 40th Street and walk one block east. Thank you for your comment. I appreciate it. We’ll try Anise Fusion again some time in the future.